For girls who appreciate the more frilly — and tomboyish — things in life, Kaelen is a brand who should be close to their hearts. 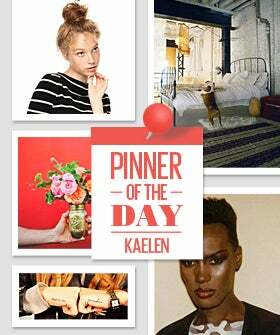 Unsurprisingly, its Pinterest account is also that magical blend of boyish insouciance and flirty girlishness (pink lips, arm tattoos, log cabins, and pastel seascapes? We're sold). What's more, Kaelen's got a cool little contest in the works. If you repin an item from the Fall 2012 Likes/Loves/Essentials/Inspirations board and leave a comment (so Kaelen knows who you are), you're entered for a chance to win your favorite piece from the label.